Figure 11 The well developed sedimentary 'cycle' at the horizon of the Lower Ardross Limestone between Pittenweem and St Monans. Sandstone at the base of the cyde forms the ridge on the right, the Ardross Limestone the ridge near the centre and the sandstone at the base of the next cycle is on the left. Walking distance 2.4 km of path, 0.8 km of rocky beach. 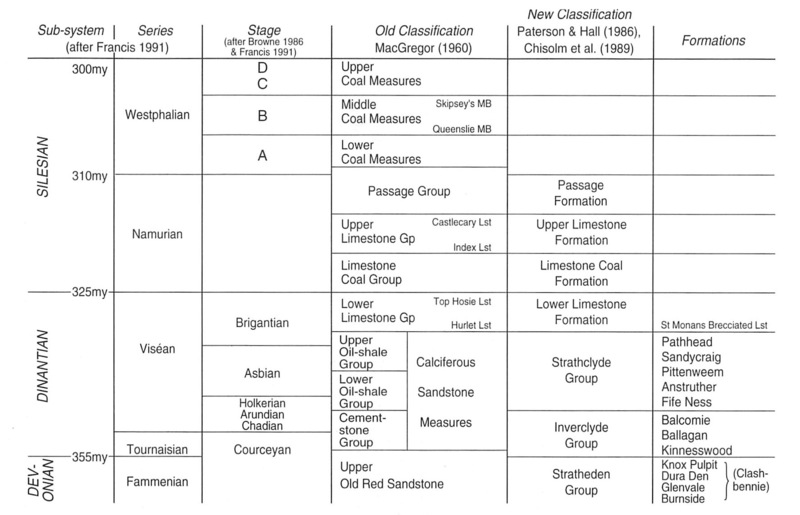 Purpose To examine Carboniferous rocks belonging to the upper part of the Strathclyde Group, in particular the Path-head Beds see (Table 4), and the greater part of the Lower Limestone Formation, which are exposed in the St Monans Syncline. Sedimentary structures and facies variation are well displayed and are described in some detail. Simple folding and faulting can also be seen to advantage. Note It is advisable to carry out this excursion at moderately low tide, especially in the vicinity of St Monans Harbour though much of the section is exposed at half tide and there is easy access by footpath to all but the last 275 m.
Route Travel south from St Andrews along B9131 to Anstruther, across rolling country with few exposures and mainly covered in glacial till. As the road descends gently to Anstruther there is a fine view across the Firth of Forth to the phonolite plugs of North Berwick Law and the Bass Rock. The Isle of May teschenite sill can also be seen 6 km offshore to the south-east. In Anstruther turn west along A917 through Pittenweem and continue as far as Coalfarm Cottages [NO 535 023]. Dismount and send the bus on to St Monans Harbour, then walk down the narrow road to Pathhead (200 m) which stands on a late-glacial raised beach. Follow the path down the steps to a lower postglacial raised beach and there walk 0.5 km north-east towards Pittenweem to the first concrete sea wall beyond a prominent bluff of sandstone. *These are known locally as 'Croupies' and, in days gone by, were taken to sea by fishermen as a defence against drowning. 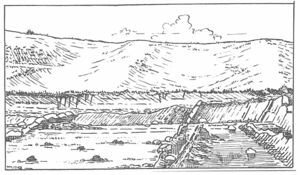 The sequence from the sea wall to the Upper Ardross Limestone is well exposed and should be examined carefully. The table shows that the sediments in the lower part of the two cycles differ, particularly in the thickness of the beds that lie between each coal and the limestone above it. In the first case, 6.6 m of varied strata are present between the coal and the Lower Ardross Limestone whereas only 0.2 m of shale occurs between the coal and the Upper Ardross Limestone (although obscured by detritus, the position of the coaly horizons may still be picked out). It is believed that the difference reflects different rates of subsidence at the ends of the two periods of coal formation: slow in the first case and more rapid in the second (Greensmith 1965, p. 234). 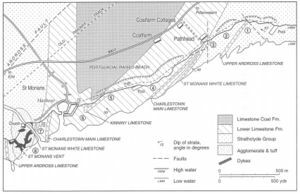 An examination of the shales beneath the Lower Ardross Limestone points to the intervention of lacustrine conditions (oil shale) followed by more marine conditions (Lingula-bearing shales) between the forest-swamp coal and the clear-water marine limestone. Between 45 m and 90 m west of the Upper Ardross Limestone, at the prominent sandstone bluff mentioned earlier, it will be seen that a 21 m-thick sandstone rests on a ripple and cross-bedded sandstone in which carbonaceous fragments accentuate the bedding. In the 21 m-thick sandstone both the bedding and the cross bedding give way upwards to convolute bedding on a large scale. This persists to within 2 m of the top of the sandstone before there is a return to normally bedded sandstone. The convolution of the bedding is believed to be due to fluidisation of the unconsolidated sand shortly after deposition. At the present day this sandstone has been planed off by wave action to produce a remarkably level wave-cut platform. Ninety metres further west at a small grassy point on the shore, examine a belt of disturbed rocks which extends along the strike for 150 m from HWM. Above and below it the sandstones dip steadily north-west at between 40° and 60° whereas within the disturbed area, large sandstone masses have been rotated dextrally to lie inclined to the general strike. The interbedded shales have deformed plastically around them. This deformation is most probably caused by slumping in the unconsolidated sediments, as has been described in modern sediments on the Mississippi delta. At HWM on the beach below Pathhead Cottage the St Monans White Limestone is well exposed and is conspicuous on account of its white colour. The beds below it also merit examination. Four metres below the limestone the sandstones are intensely bioturbated with Teichichnus and are overlain by a metre of fossiliferous grey shale with, at the top, a 5 cm thick oil shale showing at HWM the characteristic yellow efflorescence due to the mineral jarosite, an iron-bearing sulphate. The ledge-forming, lower parts of the St Monans White Limestone are brownish, crinoidal and dolomitic, while the higher, white parts are a richly fossiliferous Lithostrotion-bearing coral limestone with, less commonly, the brachiopods Athyris, Schizophoria, Camarotoechia and ' Spirifer. There is a conspicuous 0.8 m thick brown, dolomitic bed running through the white outcrop – also with Lithostrotion. Some 10 m of mainly marine shales overlie the limestone. At Pathhead the base of the Lower Limestone Formation is reached and the succession within that group should be considered before examining local details. The succession within the St Monans Syncline is tabulated below (thicknesses after Forsyth and Chisholm 1968). Recently Fielding et al. (1988) have examined the seatearths in the section, concluding that lower delta plain conditions had allowed the formation of substantial coal seams from time to time. At Pathhead the succession seen at HWM does not represent the true thickness of the beds on account of faulting. The Pathhead Fault runs into the cliff in three branches which lie in the shaly parts of the succession above and below the St Monans Brecciated Limestone and above the St Monans Little Limestone. The main fault striking N–S has a marked sinistral offset of some 18 m on the shore and there is considerable disturbance along its length. A WSW-striking branch from the Pathhead Fault has a dextral offset and cuts the St Monans White Limestone, the St Monans Brecciated Limestone and the St Monans Little Limestone. The fault offsets the last by 6 m and also cuts the overlying 2.3 m massive sandstone. Westwards, however, almost all the movement is taken up in the shales beneath the Charlestown Main Limestone, and accordingly the limestone is displaced by only a few centimetres. Note the conspicuous gap where the fault cuts the ridge formed by the massive sandstone. The St Monans Brecciated Limestone, which forms the base of the Lower Limestone Formation, is a nodular limestone containing many seams of calcareous shale or clay which branch and reunite round limestone nodules which may be up to 25 cm thick and 25 to 50 cm long. This character is maintained along the length of the outcrop and has resulted in the limestone usually being eroded out to form a trough on the beach (in contrast to the other limestones which form ridges). The name 'Brecciated' is due to the fragmented nature of the limestone adjacent to the Pathhead Fault. This brecciation, however, is found for only 1 m from the fault and nowhere else. Forsyth and Chisholm (1977) have correlated this limestone with the Hurlet Limestone as the basal unit of the Lower Limestone Formation. The St Monans Little Limestone contains giant productids which are not, however, readily collected. The topmost 5 cm are hematite stained and the remainder weathers to a pale grey/buff colour. At HWM above the St Monans Little Limestone several metres of seatearths mark the position of the Radernie Coals, up to 1.3 m thick inland, but here only a few centimetres thick. The Charlestown Main Limestone is split into an upper 90 cm bed and a lower 60 cm bed by an impersistent 3 cm shale seam. South-west from Pathhead, the Charlestown Main Limestone is succeeded by 21 m of moderately fossiliferous dark grey shales with carbonate nodules. At the base of these shales Wilson (1966) has recognised the Neilson Shell Bed faunal assemblage including Straparollus carbonarius and Posidonia corrugata gigantea. A considerable thickness of sandy beds succeeds the shales. Upwards the sandstone bands increase in abundance and thickness with sedimentary structures being well displayed. These include starved ripples, an erosion surface with shale clasts and, unusually, a sandstone with flute casts. A thin limestone is followed by black pyritous shales and sandstones with concretions up to 2 m across (these beds include the Mill Hill Marine Band horizon). Continue along the path to the west end of the swimming pool, noting very prominent jointing in the sandstone which forms the north side of the pool. The pool itself stands on a 10 m-thick marine shale band – the Seafield Marine Band horizon of the Kirkcaldy area (Chisholm 1970). At the steps at the west end of the pool, it will be seen that the sandstone is intensely bioturbated with trace fossils including Teichichnus and Planolites (Chisholm 1970). One hundred and sixty metres west of the pool and 4 m south of the path (which lies here on a low postglacial raised beach) lies the Middle Kinniny Limestone which is 1 m thick and displays Zoophycus markings in abundance in the top 15 cm. These can be seen both in section and when the rock is split along the bedding and particularly in the fallen blocks. Observe the prominent cliff at the back of the raised beach. On top of this cliff, a terrace of houses and an old windmill stand on a higher late-glacial raised beach. The windmill, restored in 1992, formed part of the equipment for working the saltpans, the foundations of which can be seen adjacent to the coast path. Coal from mines in the vicinity was extracted from either the Limestone Coal Formation or the top of the Lower Limestone Formation for use in the saltworks. The mines were abandoned about 1800 and there is no accurate information available (Forsyth and Chisholm 1977, p. 86). The salt was exported from Anstruther. Follow the outcrop of the Middle Kinniny Limestone west for 320 m to the axis of the St Monans syncline. The change of dip at the axis is very noticeable and takes place within about 3 m, the limestone in particular being shattered at the axial trace of the fold. The change in dip is from 38° NW to 70°ESE. The line of broken rocks on the axial trace can be followed down the shore in a shallow trough eroded out by the sea. The top part of the succession is then repeated in reverse order from here to the harbour wall. The next feature can only be seen clearly at low spring tide. This is a small anticline within the main syncline and exposed just east of the harbour mouth. Return to the shore at the west side of the harbour. The succession is obscured by rubbish at HWM and must be examined lower on the shore. The beds are not markedly different to those on the east limb of the St Monans Syncline and the following notes may be helpful in working down through the succession. The Charleston Main Limestone occasionally swells to as much as 2.5 m while the massive sandstone beneath again forms a conspicuous ridge on the shore and still contains abundant plant remains towards the top. The St Monans Little Limestone is again characterised by the hematite-stained top. Between these limestones is a small anticlinal fold composed of sandstone causing a prominent hump on the shore. The St Monans Brecciated Limestone weathers out as a gully and is thus not easily detected although it occurs at the expected horizon. The St Monans White Limestone forms a prominent ridge, particularly near HWM. It contains the same brown dolomite band, but is no longer a coral limestone as it was at Pathhead; instead it is more compact and crinoidal. The shales overlying it are particularly fossiliferous and at HWM an impersistent 25 cm limestone band 1.2 m above the base is packed with Camarotoechia, Productus, crinoid ossi- fies, bivalves and bryozoa. The beds beneath the St Monans White Limestone (comprising sandstones with seatearths, sandy shales and thin coals) are somewhat disturbed by faulting. Fourteen metres of these beds crop out before the St Monans Neck interrupts the succession. At low spring tides the St Monans White Limestone can be traced across the St. Monans Burn. It strikes almost due south and dips 45°E before being cut off by the neck as are the various sandy beds beneath. The St Monans Brecciated Limestone can also be traced across the burn until it too is cut off by the neck. A short distance seawards both limestones reappear dipping at about 60° NW off the flank of a sharply folded anticline which plunges steeply NNE. The strike of the sediments swings round in a few metres to almost north–south, dipping steeply east. An ENE–WSW trending fault throws these beds about 30 m east where they reappear as a series of reefs lying offshore. From aerial photographs it can be seen that the strata maintain their north-south strike past the St Monans Neck on its seaward side and are continuous with the rocks on the western side. Walk back to St Monans Harbour to rejoin the bus and return to St Andrews. CHISHOLM, J. I., 1970. Teichichnus and related fossils in the Lower Carboniferous of St. Monance, Scotland. Bull. Geol. Sum. Gt. Br. No 32, 21–51. FIELDING, C. R. et al., 1988. Deltaic sedimentation in an unstable tectonic environment – the Lower Limestone Group (Lower Carboniferous) of East Fife, Scotland. Geol. Mag., 125, 241–55. FORSYTH, I. H. and CHISHOLM, J. I., 1968. 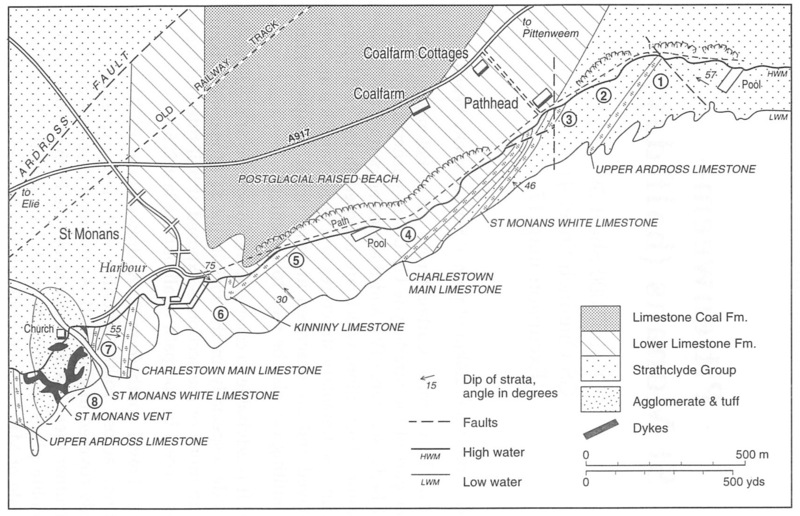 Geological Survey boreholes in the Carboniferous of East Fife, 1963–4. Bull. Geol. Surv. Gt. Br. No 28, 61–101. FORSYTH, I. H., 1977. The geology of East Fife. Mem. Geol. Sum. Gt. Br. GREENSMITH, J. T., 1965. Calciferous Sandstone Series sedimentation at the eastern end of the Midland Valley of Scotland. Jour. Sed. Petr. 35, 223–42. WILSON, R. B., 1966. A study of the Neilson Shell Bed, a Scottish Lower Carboniferous marine shale. Bull. Geol. Surv. Gt. Br. No 24, 105–30.